Mark and I moved from Contadora, the “main” and most touristy island of Las Perlas, to the east side of the biggest island in the chain: Isla del Rey. 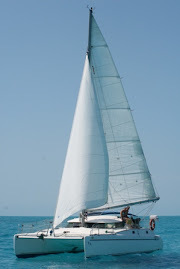 The distance was only about 15 miles and all we hoped for was some wind and no current against us, something we seemed to always “time right”, meaning it has been taking us forever each time to switch anchorages, even though the distances are short. On this beautiful sunny day with deep blue skies and not a white puff of a cloud, we had a magnificent sail. Not in the way of speed or it being invigorating – there just is not enough wind for that in this area, gone are the trade winds - but magnificent in the way of our surroundings. There was barely 6 knots of wind from the north, so behind us, and we had pulled the spinnaker up. The seas were flat; the ride was smooth, comfortable and very pleasant. We didn’t mind only doing 2.5 knots, one or more of which was current; the brand new autopilot didn’t mind doing all the work. It took us about 7 hours to reach our next destination Espiritu Santo, but the last couple of hours were filled with entertainment on top of relaxation. While Devil Rays were jumping and doing summer saults all around us (they leap out of the water and do acrobatics in the air! ), we spotted some whales in the distance. Through binoculars, we saw them take turns breathing (“Look at the water spout!”), breaching (“Wow, he’s coming out of the water”), sliding along the surface (“His body is huge!”) and disappearing (“Watch the forked tail!”). It was an awesome spectacle and we are starting to believe the stories about an abundance of sea life in the Pacific Ocean. We also noticed big, turbulent spots in the water, where hundreds of fish had gathered. The areas looked like breaking waves. Unfortunately, we were going too slow to catch anything. I should probably mention the birds as well: pelicans, frigate birds, birds of prey, they are ever-present at all times of the day and in large numbers. The other day, I spent an hour on the beach and counted at least ten different species of birds, while lying on my back in the powdery sand. To finally be surrounded by all these amazing creatures is a joy and – for me – one of the main reasons why I (still) live on a boat!